Getting around during the 106th Grey Cup festival, parade and game. From November 21–24, thousands of visitors will flock to downtown Edmonton to take part in the Grey Cup festival and parade. The excitement will culminate with the 106th Grey Cup championship game on Sunday November 25, at Commonwealth Stadium. Here’s what you need to know to have a great Grey Cup experience. 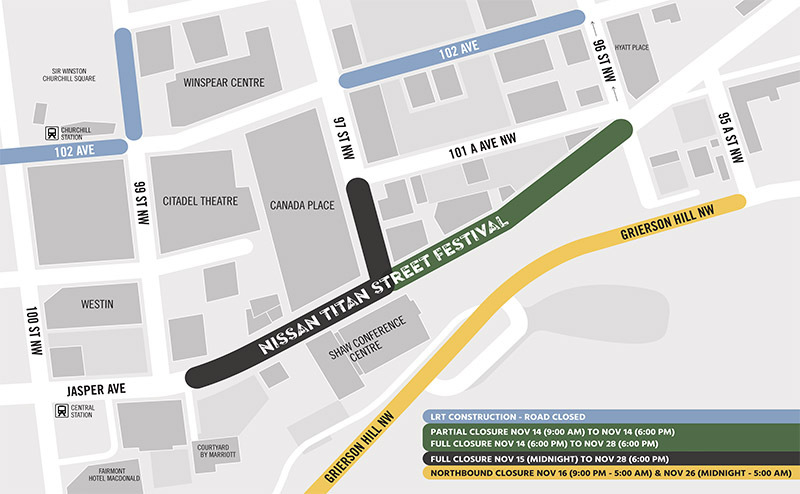 Taking place November 21 to 24, the Grey Cup Nissan TITAN Street Festival will be a 4-day family-friendly event. Situated on Jasper Avenue, from 96 Street to 99 Street, the festival will include a number of exciting activities, such as the Capital Power Zipline, the EPCOR Street Ski, the Jiffy Lube Tube Slide and a bungee jump! A number of road closures and bus detours will be in effect in the downtown core for the festival and parade. Please plan your route in advance and leave extra travel time to get where you’re going. Streets will re-open by 6pm on November 28. Edmonton Transit Service (ETS) will detour several bus routes on Jasper Avenue, between 95 Street and 100 Street, for the Grey Cup festival. Temporary bus stops will be operating. Specific temporary bus stop locations, as well as additional information related to these detours, is available here. ETS advises anyone impacted by the changes to check the updated schedules on the Trip Planner at takeETS.com, or via third party apps. Please give yourself extra travel time. Parking restrictions will be in effect. Illegally parked vehicles will ticketed and towed. Street parking and parkades are available at various downtown locations. Regular rates apply. A taxi, ride share and public drop-off and pick-up area will be located on Jasper Avenue, from 95 Street to 96 Street. The accessible drop-off and pick-up location for Disabled Adult Transit Service (DATS) and those with approved placards is on the south curb of 100 Street and Jasper Avenue (going eastbound). The funicular will be operational from 7am to midnight, from Thursday November 22 to Saturday November 24. Bundle up and bring the family to watch the CN Grey Cup Parade on November 24 from 11:30am–1:30pm. A Grey Cup tradition, the parade will feature hundreds of participants, floats and marching bands. This year’s Grey Cup parade has teamed up with Santa’s Parade of Lights, which will be presented in its entirety following the last Grey Cup entry. 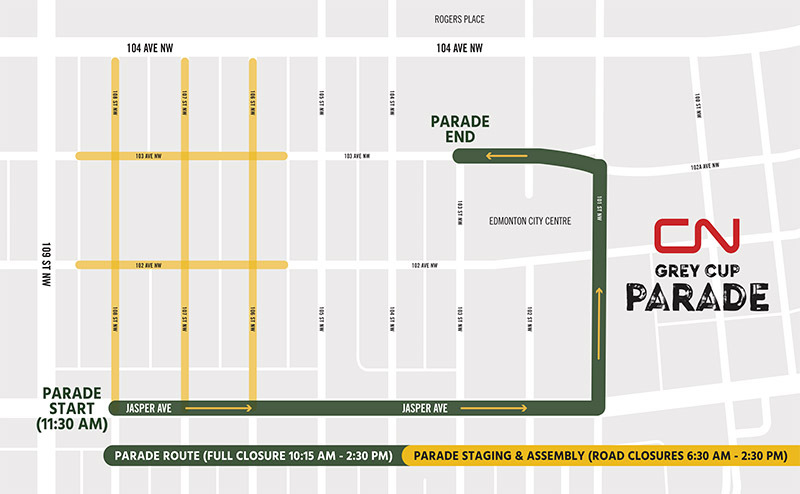 Parade Route: The parade will start at Jasper Avenue and 108 Street, heading east to 101 Street. It will then head north on 101 Street to 102A/103 Avenue, where it will travel west, ending at 103 Street. Access to off-street parking facilities in this area will be maintained via 106 Street and 107 Street until 8:30am only. Street parking will not be permitted along the parade route. Vehicle tag and tow operations will be in effect. Edmonton Transit Service (ETS) is detouring several bus routes for the Grey Cup parade on Saturday November 24. Temporary bus stops will be set up and operating. Specific detour details are available here. On November 23 the aquatic centre, indoor field house, indoor track and gymnasium at Commonwealth Community Recreation Centre will be closed, with the fitness centre remaining open. On November 24 and 25 the facility will be fully closed. Facility patrons are asked to use other recreation centres such as Clareview Community Recreation Centre, Kinsmen Sports Centre, and Londonderry Leisure Centre on these dates. Those attending the game are encouraged to take public transit to the Stadium. ETS is providing football fans extensive service for the 106th Grey Cup at Commonwealth Stadium on Sunday November 25. ETS will operate dedicated bus service from Football Park & Ride lots beginning at 1:30pm, with the last bus departing each lot at 5pm. Following the game, Park & Ride service will return passengers to their respective lots beginning at 7pm until the stadium is empty. Service from Burns City Lot will detour due to road closures around Commonwealth Stadium. Additionally, ETS will honour the Free Ticket to Ride program from 11am until 2 hours after the game ends, allowing customers with a ticket to the Grey Cup to ride transit for free. Children 12 and under who are accompanied by an adult can also ride free. From start of service until approximately noon, Capital Line LRT, which stops at Stadium station, will operate every 15 minutes. After noon, frequency will increase to every 7–8 minutes until approximately 10pm. Metro Line trains will operate on a regular Sunday schedule. ETS advises anyone affected by the changes to check the updated schedules on the Trip Planner at takeETS.com, or via third party apps. Please give yourself extra travel time. For details about the Grey Cup game and festivities visit the Grey Cup Festival website.